Highly popular among ravers and nightlife enthusiasts, these tattoos stand out strikingly well at popular social gatherings such as nightclubs and concerts. Whether you plan on creating an invisible tattoo (in daylight) to keep a happy boss or you are contemplating the popular choice of upgrading your existing tattoo to generate a stunning effect, there is no doubt that these vibrant pieces bring about a definite wow factor (if done correctly by an experienced artist). However, there are some stark downsides to getting a glow in the dark tattoo that you should definitely be made aware of before stepping foot into a tattoo studio. 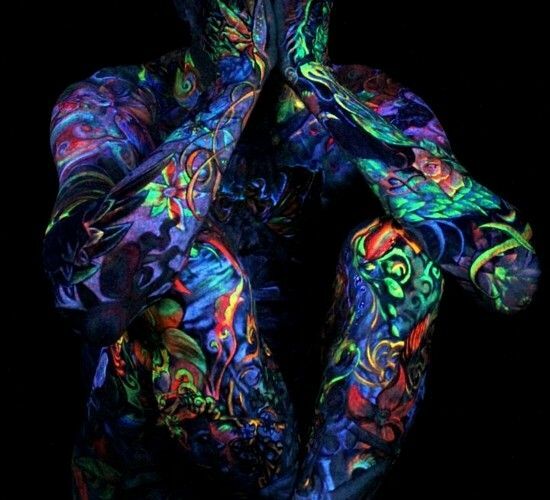 Glow in the dark tattoos usually contain bright, fluorescent colors that are invisible in daylight. This tattooing technique is relatively new and became popular in the 90’s, along with the neon trend. Unfortunately, glow in the dark tattoos don’t quite live up to the name that they imply, and they will not simply just ‘glow in the dark’ without a little bit of help. A black light, also referred to as a ‘UV-A light’ is usually required in order for these tattoos to glow. Black lights are used for several purposes. Not only are they used to create decorative/artistic lighting effects, but also for tasks such as the detection of counterfeit money and attracting insects (those big ‘zapper’ machines you see everywhere). To create these tattoos, artists will use an ink solution containing phosphorus, in addition to the vegetable, metal, or plastic-based pigments used in traditional tattoos. For those of you who may not know, phosphorus is the substance used in glow sticks, so before you get distracted by the beauty of this type of tattoo, it is important to consider the safety aspects of the procedure. Glow In The Dark Tattoo Ink - Is It Safe? Well, to be frank, phosphorus is a highly toxic chemical element, known to our ancestors as ‘the devil’s element’, due to its use in friction matches, explosives, poisons, and pesticides. It is essential to know that phosphorus-based inks have not officially been approved by the FDA, on the grounds of safety concerns. There is a high amount of uncertainty regarding the long-term effects this ink will have on your skin and health, especially since phosphorus has been proven to be a cancerous compound. For these reasons, very few tattoo shops will offer a service using phosphorus-based inks. There have been reports that people have suffered complications and allergic reactions with the ink. Although side-effects appear to be rare, some reactions include burning sensations, skin rashes, itchiness, and/or severe blistering. The majority of customers also noticed a significant increase in swelling around the area when compared to a regular tattoo. Some were compelled to have the new art removed due to these side-effects. 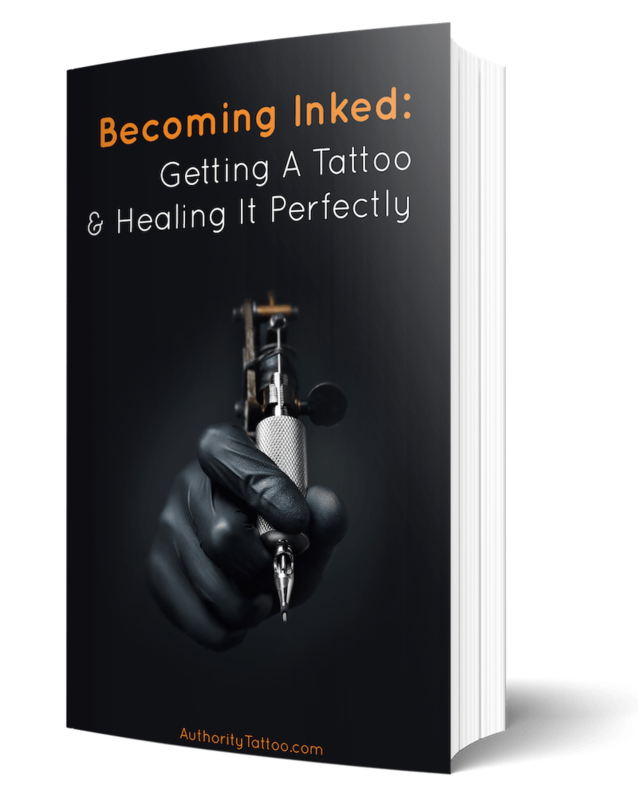 It should also be known that many of the above symptoms, such as itchiness, rash, swelling, and burning sensations are also all common with standard-ink tattoos, and therefore it may be hard to single phosphorus out as the main culprit. How Long Do Glow In The Dark Tattoos Last? Glow in the dark tattoos should last as long as regular tattoos, however, as stated above, this up and coming trend has only been around for a decade or so, and therefore it is going to be a while before we fully understand the long term effects of phosphorus-based tattooing procedures. As with most tattoos, they will likely fade slowly over time, especially in the sun, and it is advisable that they are touched up if any noticeable fading has occurred. If you choose to cover your glow in the dark tattoo with a colored one, the ink may appear dull or faded, and the glow in the dark properties may no longer work as well as they once did. It is worth noting that it is up to the discretion of a tattoo artist as to whether or not they choose to touch your tattoo up for you. It is very likely that some artists will turn down your request due to the nature of the tattoo in its current state (the inclusion of phosphorus). UV tattoos are similar to glow in the dark tattoos in the way they are invisible in daylight; however, UV ink is thought to be as safe for your skin as ‘normal’ tattoos, as they do not contain phosphorus. Both glow in the dark ink and UV ink can be seen under a black light, fluorescent lamps, light- emitting diodes (LED’s) and some lasers. Another similarity of the two is you may need to be more generous with your time if this is the type of tattoo you truly desire. A black light is necessary to apply the ink - As I’m sure you can understand, invisible ink is not going to be easy to administer and will require a more concentrated approach. The ink is thinner - and may therefore present a bigger challenge to the tattoo artist. More skill is required - The first two points mean that greater artistic skill and experience will be needed. As a contrast, a downside to UV ink is that it can commonly pool under the skin and produce firm ball-like nodules under the skin after a variable amount of time (depending on ink dilutions, and how your body reacts to the ink’s properties). Ensuring your brand new tattoo doesn’t become infected is your responsibility from the second you walk out of the shop. Your artist should have taken the appropriate steps to clean your new ink, before proceeding to wrap it. 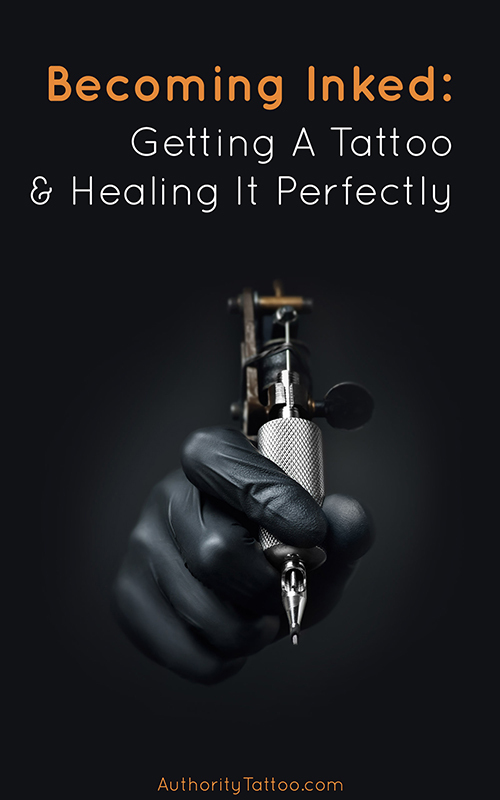 Hopefully, your artist will have advised you on a precise time-frame for how long to keep your tattoo wrapped and how to clean it thereafter (we also have incredibly in-depth aftercare & cleaning guides for you to take a look at should you need to). On occasions, it is okay to uncover your tattoo within two to three hours (if you have the means to clean it instantly in a hygienic environment,) or you may be required to wear your wrap/ bandage overnight. This is for your own comfort as the area will still be tender and inflamed. The most crucial element of the process is making sure you have washed your new tattoo effectively. Failure to do so could result in infection or delayed healing. As you remove your wrap, you will see that you are covered in all sorts of funky stuff - blood, ink, and oozing plasma. You will need to wash all of this off thoroughly to help prevent excessive scabbing. It is advisable you use your (very clean) hands to wash your tattoo, rather than a flannel/fabric cloth as they can harbor many germs. Fragrance and alcohol free antibacterial soap is recommended so you don’t burn or otherwise irritate your sensitive skin. Do not use hot water as this could open up the pores in your skin and may cause the tattoo ink to run. It could also potentially burn the very delicate area around the tattoo. Instead, try lukewarm water as this will still help to loosen and persuade the ‘goo’ to leave your skin. You might like to consider using a paper towel to pat dry your tattoo after cleaning as it’s common for excess ink break out from the area, and you probably don't want to stain your towels. Also, as stated earlier, towels can hide lots of bacteria, even when freshly washed, so avoid anything which may potentially transfer germs to the site of your tattoo. Finally, always refrain from rubbing your tattoo dry as this could rip off scabs and cause fading; pat/blot dry instead as mentioned above. The final cleaning routine phase is to moisturize. The best tattoo moisturizing lotion I've ever personally used is a (vegan) tattoo aftercare product called Hustle Butte﻿﻿r. This stuff works amazingly well during the healing process - not only to keep your tattoo really well hydrated, but it's also very good at soothing that annoying itching and irritation. Only a thin layer of lotion is necessary. As with any wound we may sustain, the skin needs to breathe in order to heal, and a wound caused by the tattooing process is no different. Repeat this course of action twice-daily until the tattoo has completely finished peeling and scabbing (preferably first thing in the morning and once in the evening). As advised in this article; glow in the dark tattoos can look striking under the correct type of light, but they can also be very dangerous and hazardous to your health. Before undergoing any procedure containing harsh chemicals such as phosphorus, always read up on the risks and dangers involved, and make sure your artist is experienced and knowledgeable enough on the subject of tattoo ink components. Hopefully, by taking in all of the information above, you can now make an informed decision as to whether the attraction of a cool looking tattoo actually manages to outweigh the risks involved in its very creation.